In the first six months of 2011, Occupancy, ADR and RevPAR were all on the rise in the hotel industry. According to STR data, “The U.S. hotel industry finished June with the highest revenue per available room since August 2008.” Will this steady improvement continue into the second half of the year? What are the greatest opportunities for hotel investment? 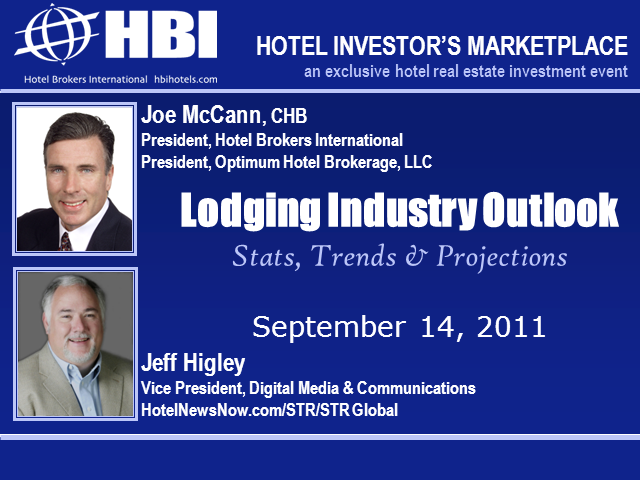 Join the Hotel Investor’s Marketplace Webcast as Joe McCann, president of Hotel Brokers International, and Jeff Higley, vice president of digital media & communications for HotelNewsNow.com/STR/STR Global, sit down to discuss the outlook for the hospitality real estate industry market. Jeff will share the most recent hotel performance trends data tracked by Smith Travel Research. Joseph R. McCann, CHB, is president of Hotel Brokers International and president of Optimum Hotel Brokerage. Joe is a thirty-year hotel industry veteran who has held senior management positions with Hilton and Marriott at their largest and most successful properties. During his hotel brokerage career, he has closed more than $500 Million in hotel asset transactions and his Philadelphia-based firm, Optimum Hotel Brokerage, is recognized as one of the leading hotel brokerage and hotel capital advisory services companies in the United States. Jeffrey Higley is the vice president of digital media & communications for HotelNewsNow.com/STR/STR Global. Jeff, a 26-year journalism veteran, has specialized in the hotel industry for the past 14+ years. He launched HotelNewsNow.com, a division of Smith Travel Research in September 2008. Prior to joining HotelNewsNow.com and Smith Travel Research in March 2008, Higley served in various leadership positions for Questex Media Group’s Hotel Management. Higley was instrumental in the company’s launch of Hotel Design, Luxury Hotelier and The Hotel Times magazines.